1. Print out egg patterns on to white card stock and cut them out. 2. Color the eggs with crayons or markers; accent with glitter glue or glitter sticks. 3. 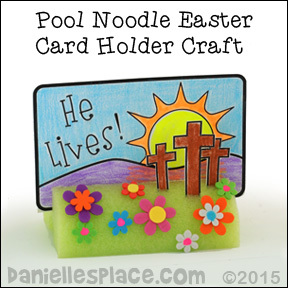 Hang on a tree with yarn or decorate a bulletin board for Easter. 3. Cut a slit at the rounded top of the holder lengthwise across the center of the cylinder about 1/2" deep. Use this slit to hold the Bible verse card. To make this craft you will need green, blue and white paper, craft sticks, colored printer, glue, large paper plate, brass brad, and scissors. The foreground picture says, "Is Jesus in the tomb? Roll the stone away! 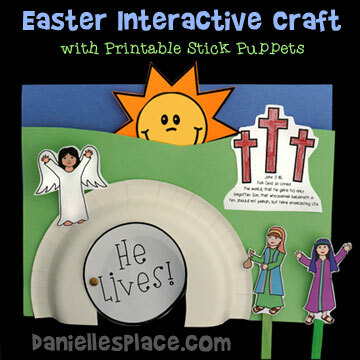 Use the Easter Stick Puppet to review your Easter lesson. This stick puppets are larger than the ones pictured above. Each puppet is about five inches tall. Instant Download Pattern $2.00 - Jesus, two disciples, two women with spices facing left, two women with spices facing right, two happy women, angels facing right, angels facing left, two guards, scared guards, crosses and sun. 1. Cut the bottom three inches off of a paper plate. Measure three inches up from the very bottom of the plate and draw a line straight across the plate from side to side. 2. Glue the two sections of paper plate together top to top so that the cut edges are at the bottom. 3. Cut a six-inch circle from yellow paper and glue it to the center of the plate. Fold back the bottom part of the circle so that it comes out the back of the plate. This will help the piece stand up. Instead of using yellow paper, you can just paint the inside circle. 4. 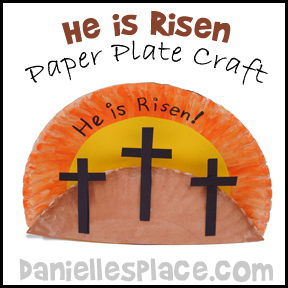 Paint the paper plates and write "He is Risen!" at the top with a magic Marker. 5. Cut cross shapes from black card stock or construction paper and glue them to the front paper plate. An Easter Sunday School Lesson that goes along with this book is available on The Resource Room. This is a simple and surprising craft. Fold up the petals of a paper flower and place it in a bowl of water. After a few seconds the flower will start to open. Watch the video below to see a paper flower that has been placed in water blooming. One page of three flowers. Use cheap printer paper and crayons for best results. 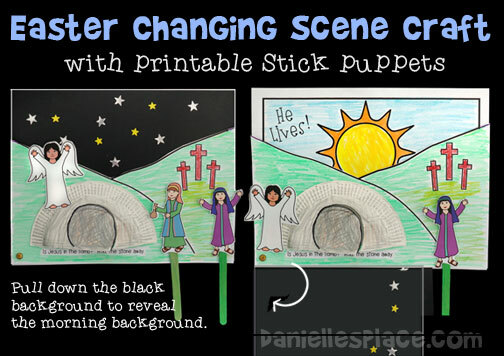 Use flower stick puppets to tell the story of Easter. 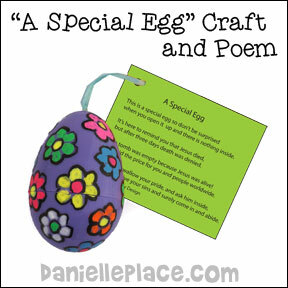 This craft goes along with the free Bible lesson "A Very Special Egg". 2. Cut ribbon about 6" long so that there are points at each end. Poke the ribbon through the tiny holes from the inside to the outside. Pull the ribbon through the holes and tie the poem card to the ribbon. 3. In class have your children decorate the eggs with liquid chalk markers. If you have very young children, you stickers instead. 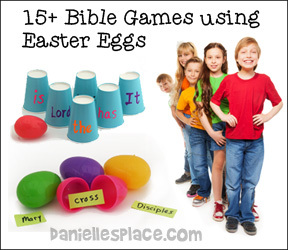 All the games are easy to prepare, and use only plastic Easter eggs and other easy-to-find supplies such as markers and paper. 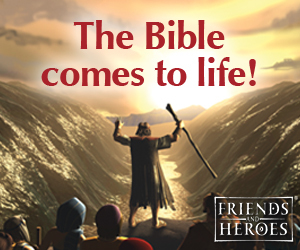 The games can be adapted to any Bible lesson, and are used to review the Bible lesson and help memorize the Bible verse. Children of all ages will love these games! 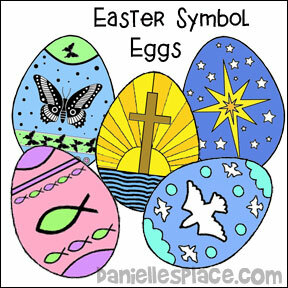 Go to the Easter Game Page to view them. Print out the poem and have your children color the jelly beans. 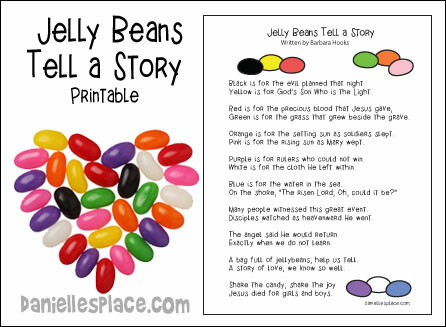 You can also have them pick out one jelly bean for each color represented in the poem from a bowl of jelly beans and place them in a bag to go with the printout. Black is for the evil planned that night. Yellow is for God’s Son Who is the Light. Green is for the grass that grew beside the grave. Orange is for the setting sun as soldiers slept. This play can be done at any time during the year and there are no lines to learn (except for the preaching). You will need the CD, "All the Way to There", by John Berry. The play is acted out to the song "How Much Do You Love Me?" I had a 6 year old act out the part of the little girl, a teenager for the teen and an adult for the married woman. This song (in case you haven't heard it) talks about a small girl playing with a dinosaur and she asks her father (played by the Pastor) if he wants to play dinosaurs with her. He's reading a paper and puts it down and chases after her. (We had a set of 3 stairs made that she could climb up). On the second stair, she turns around and looks at her dad. (In the song, it says that she asked, "How much do you love me? How much do you really care?" Then the dad follows the song, by touching his heart and stretching out his arms as the song plays the words "All the way to there". They hug and the little girl exits. Next scene is the teen calling her dad. She waits on the steps and he drives up (two chairs put together as dad pretends to drive.) She gets in the car crying. He anticipates that she needs to know how much he loves her, so he taps her on the shoulder and again touches his heart and stretches out his hands as the song plays "all the way to there". They part with a hug. Last scene - a woman with a suitcase gives the dinosaur to her dad and kisses him good-bye and waves. She goes to the stairs and looks very sad and lonely (song says she's 1,000 miles away). Looking towards her, but sort of over her head, he touches his heart and stretches out his arms. She looks in his general direction and touches her heart and stretches out her arms too. The play ends like this. Next, the preacher goes to the first step and talks about how joyous we are when we first find Jesus. How everything seems fun and we have so much exuberance. On the second step, the preacher talks about the "teen" years in a Christian's life --the years of conformity (The trial years). Finally, on the third step, we talk about the "married" state - how we have learned to trust Jesus for better or for worse, etc. and are waiting now to see Him face to face. Preacher should emphasize that Jesus loves us "all the way to there". I added some very sentimental songs regarding how much Jesus loves us. At the end, I had the cast come up one by one, starting with the little girl and stand in front of the cross and put up her hands. I had asked some key members of the congregation before the play if they would come to the altar and do the same when they saw the cast doing this. The effect was phenomenal. When I turned around, the entire church was at the altar with their hands raised in praise! 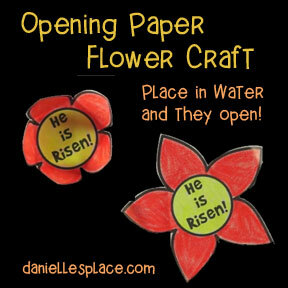 For more craft ideas go to the Easter and Spring Crafts Page. I've taught Bible classes for almost 30 years. 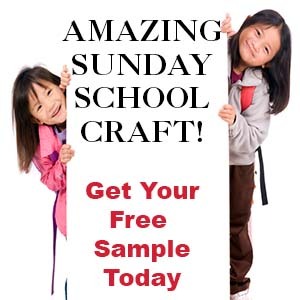 Even though I always added my own ideas, I had gotten really tired of the purchased curriculum our church used. I found your material online several years ago and finally asked our education director last year for permission to use it instead. You've rejuvenated me as a teacher and my students love the lessons. The crafts are more work than the punch-outs in the purchased curriculum but so much better! Our church has a good support group for us teachers that make it much easier for us. We have wonderful volunteers who work each week in our Teachers' Workroom. I make copies of your craft/game/visual pages and give to them at least two weeks before I plan to teach the lesson. They have the material ready for my students tell me they really enjoy getting your crafts ready for the students. Noahs Ark Easter Eggs Filled With Candy 12ct. Scripture Candy Jelly Bean Prayer Cross Tin With Hangtag, 1.25 oz.